When you want to be a podcast guest, you’ll need to keep a few “dos and don’ts” in mind. 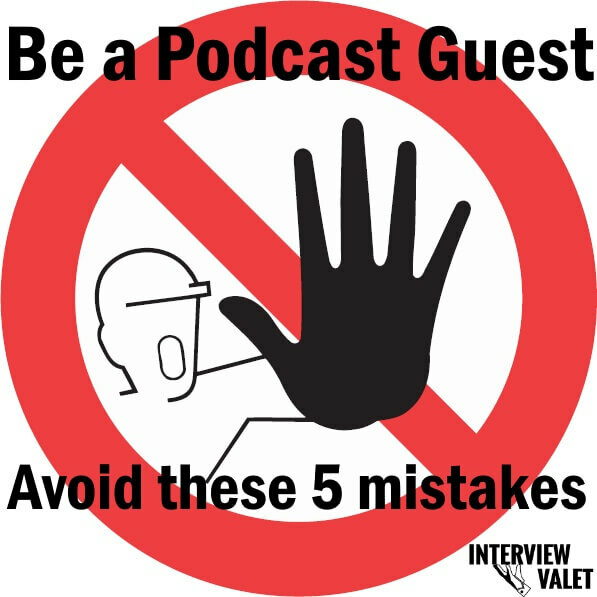 Check out the short video with 5 things to avoid to be a podcast guest. Transcript: Hey this is Dan Moyle, the Inbound Evangelist with Interview Valet. And today we’re talking about how to be a podcast guest, and the 5 things that you need to avoid. Number one: Don’t have an ego. You might be a bestselling author in your niche; that doesn’t mean that everybody in that niche knows you. It doesn’t mean that anybody outside of that niche knows you. So don’t pull that, “Do you know who I am?” card. Act with humility. That’s a great rule of thumb in general, but especially for podcast hosts – they may not know who you are and that’s OK. They may ask for a pre interview chat and that’s OK too. Maybe they will. No problem. Well look you know shows like Jimmy Fallon and Jimmy Kimmel and you know big shows, Good Morning America. The producers often asked for pre-interview chats and just so that they could get to know you have a couple of stories that complot for the host this kind of thing. And if the podcast host asks for that. No worries don’t go in with the well I’ve been on 100 interviews don’t you know who I am. It’s no big deal – 15 minutes to share a couple of stories get to know him that’s going to make it a great interview. Number two: Don’t worry. You see these podcast hosts want great content and you are the subject matter expert you know your story. This is not “gotcha” journalism like we used to see on like 60 Minutes. This is a podcast host who wants the great content. You have your story for their listeners. You’re going bring value to them with this kind of thing right. So they’re going to ask you about your story. And who better to tell your story than you. So don’t worry so much. 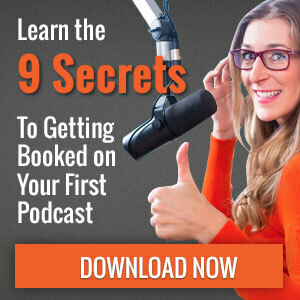 Number three on how to be a podcast guest and don’t do these things: Don’t skip the prep time. Even though you know your story go in with some preparation right. Make sure you understand first of all their audience. They call them something special. Make sure you know what kind of an interview it is. If it’s 20 minutes you may have to tell more concise stories if it’s 45 minutes. You’ve got a little more time to fill right. So prep time is very important. Make sure maybe you know you have a few tips and tricks laid out. Because if they they ask you what you want you give our listeners. You don’t want to sit there and hem and haw and think “OK what do I need to say?” or whatever. So, know the show going in and be prepared. In fact one of the nice things is to know you listen a couple episodes or have a brief scene or something from that show that you know maybe they always ask one particular question. If you go in with “Wwell gosh I’ve never thought of that,” they know right away that you didn’t prepare so don’t skip the prep time. The fourth tip on what not to do in order to be a podcast guest don’t skimp on the equipment look amateur equipment. You know you’re buds with a microphone or a Bluetooth microphone, like Airpods sitting in a cafe. It’s not going to work right. You want to have a nice microphone like an Audio-Technica microphone or something like that – something kind of decent. The one I’ve got right here is nice it’s only like $25, maybe $30 – not very expensive. You just want to make sure that you have good headphones now and that you can use maybe your ear buds but have a good microphone right. You need to be able to hear the host. And finally a great Internet connection. If you go in with bad wifi and it’s all garbled they’re not going to like it. So be a good a great podcast guest by having professional equipment. Onto the fifth “not to do” tip here for you to be a podcast guest: Don’t forget the promotion. Like once this interview is all done and wrapped up in its live make sure you promote the heck out of it OK. Use Twitter, LinkedIn, Facebook, your email lists… ask your friends and family ask people to go and rate and review your episode and the podcast itself this kind of thing right. Some syndication platforms can do that. Make sure that you share the crap out of it OK. The promotion is so important not only does it help you with your episode but it helps the host and it gives that good feeling and a good connection with them right and then maybe they’ll want you back where they’ll tell their friends about it. So be a great podcast guest, by sharing those shows. Again I’m Dan Moyle with Interview Valet, we appreciate you watching. Here’s to podcasting together. Cheers.